Lorraine Doll passed away peacefully on March 20, 2019 surrounded by family. Lorraine was born August 13, 1933 to Antone & Elizabeth Kautzman. She married Leo Doll on February 20, 1950 in Mandan, ND and they were married 69 years. She was a strong and loving mother to her seven children; teaching them good work ethics and other valuable lessons in life. Mom was a great role model to all, and will be greatly missed. Lorraine loved cooking, gardening and needle work. Mom liked to have family gatherings and playing cards, camping and fishing. Lorraine is survived by her husband and seven children, Sandy (Bill), Rick, Martin (Sue), Pat (Dale), Cindy (Rich), Dave (RaeAnn), Dan ( Suzanne); 14 grandchildren & 21 great-grandchildren; and her 2 brothers, Pat & Herman Kautzman. 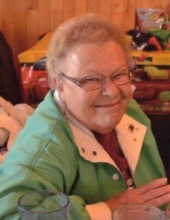 A Celebration of Lorraine’s life will be held at 12:00 pm on Friday, March 22, 2019 at St. Patrick Co-Cathedral, 215 N. 31st Street, Billings, MT. To send flowers or a remembrance gift to the family of Lorraine Doll, please visit our Tribute Store. "Email Address" would like to share the life celebration of Lorraine Doll. Click on the "link" to go to share a favorite memory or leave a condolence message for the family.